We are located on the College campus, east of Founders House opposite the Sahara Field. >Please Note: The School Shop will be closed from the 15th December 2018 to the 2nd January 2019 (inclusive dates); re-opening on Thursday 3rd January 2019. In the Shop there is a suggestions/complaints/compliments book – please feel welcome to use this for any feedback and encourage others to do so. It helps to know what issues need attention and if you’ve experienced good service, it gives the staff a boost. The Shop also runs a book with the name of anyone waiting for anything – if the pupil or parent’s name is not in this book, it is assumed there is no back-order; so please ensure that if there is ever anything you need that is not in stock, this must please be noted in the book. The Bishops Shop opened its doors on 25th September 2001. This important initiative was in response to continuous pressure from parents and staff following the need for improved service and convenience for parents in the procurement of school uniform, other school clothing, sports equipment and general items of use. 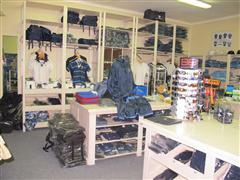 The School Shop also stocks the uniforms of Western Province Prep School, Micklefield and Herschel Girls. Bishops has an agreement with The Shop that includes a market related rental for the premises they occupy and a 25% share in the net profit of the shop. All such funds received are placed in the BishopsScholarships and Bursaries Fund, administered by the College Council Investment Committee. The agreement between Bishops and The Shop has been reviewed and renewed several times over the years. The governed cost price mark-up, the overall pricing policy and the competitive selling prices offered by The Shop (tested against other school shops and retailers of school uniforms) are monitored quarterly by the Bishops Business Manager, in conjunction with the business owners Paul Burton and Peter Kilpin. The Shop provides us with one of the most convenient and pleasurable school shopping services that one may encounter. We know this to be true because we have visited many and we are the envy of almost all schools.